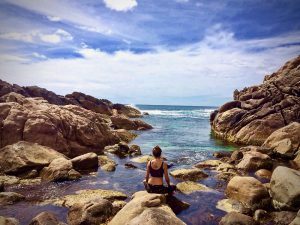 We took some time out to catch up with Collette Davis ahead of her two workshops Story of Freedom and Story of Awakening in August to find out more about her yoga journey, travels, yoga training and of course these incredible workshops. We can’t wait for you to come to Kula for your Story of Freedom workshop on 11th August, what can students expect? Socrates said that the only true wisdom is in knowing you know nothing. This is really where I’m at in my practice. I’m letting go of all the ideas of how we ‘should’ move and have become much more interested in what my body has to say and where my intuition wants to take me. One of the ways I cultivate this is through deepening my meditation practices and allowing my body to lead. This is what freedom means to me. Getting past all the programs and ideas and conditioning. Questioning the way I’ve done things or I was told to do things and paying close attention to what I really know to be true, based on my felt or direct experience. Students don’t need any experience to attend but you do need to be curious. Come with open hands, an open mind and a willingness to participate. You will know if it is calling to you. The invitation, as ever, is to listen and then respond. You recently went travelling / have been living abroad do you bring these new experiences or cultures into your teaching? Being inside my own practice for 18 months has been such a privilege. I’ve had a lot of time to experiment in my body, cultivate my intuition and find a palpable stillness that I can tune into whenever it gets too noisy. These are some of the gifts that I intend to share in the workshop. Doorways into Self that will give you a greater sense of trust in your own wisdom, an imprint of the abiding awareness inside and a remembrance that there is always a part of you that is not in struggle. Will music be part of the workshop? Music is vibration and a great reference point to bring people into an awareness of their own energy field. Of their own unique musical signature. It can lead people into deeper states of flow, whilst facilitating the intention of the practice and the movement of the room. Can you describe what intuitive flow is like? My Story of Freedom workshop is designed to guide participants into deeper and deeper states of flow so they can eventually move freely and without instruction. I will be providing guidance and the flows will be semi-led but I won’t be ‘teaching’, as such. The asana will be relatively simple and repetitive so you can get into ‘your own rhythm’. From there, anything can happen. My intention is to empower students through their own intuitive knowing, so they can experiment more freely and develop their home practice. We will build the collective field together through journaling, mantra, pranayama and meditation. We might do some light partner work, before movement and asana, then travel into the world of yin before a long savasana, journaling, sharing and close. What is your favourite type of yoga to practice? In terms of asana, I like to move freely. 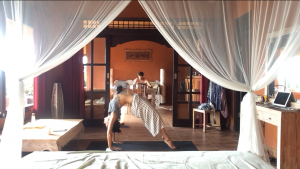 I’m heavily influenced by Embodied Flow and Anusara but I’m also happy in a Mysore room. When and where did you do your yoga teacher training? I’ve done a bunch. My first training was in London in 2014, over 8 months, with Leila Sadeghee, Bridget Luff and Tara Judelle. I then did a 300hr training in Berlin with Sianna Sherman, 30hrs with Elena Brower, a 100hr training with Ana Forrest, a 100hr Embodied Flow yin training in Sydney with Scott Lyons and Satu Tuomela and I’ve just done a 100hr Embodied Flow training with Tara Judelle and Scott Lyons in Nuremberg. I’ve assisted a 200hr TT and I’m currently studying on a 6-month Soul Immersion with Christopher Wallis, a Tantrik scholar-practitioner and deep wisdom keeper of the tradition. Who is your yoga teacher? Leila Sadeghee, Bridget Luff, Tara Judelle and Christopher Wallis. The practices of yoga give me a map of seeing. A way in which to look at life, so I can get closer to the mystery of who I am. Yoga allows me to move with greater ease through the world, and in relationship to myself and others. It calls me into stillness and it illuminates my intuitive sense of direction, so I can make better choices on a moment-to-moment basis. 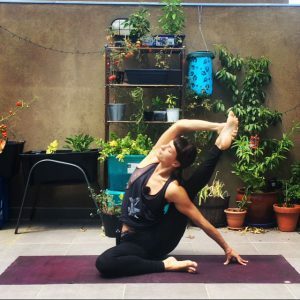 Yoga Kula has postponed Collette’s upcoming August workshops, but we promise to bring Collette back to the studio very soon so watch this space.